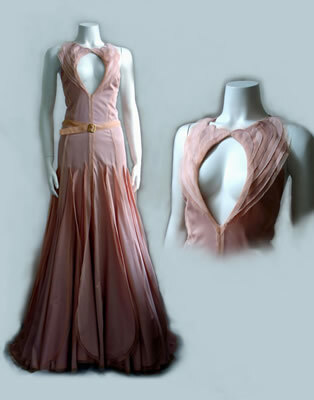 A Beautiful gown. Open neckline gown with petal work detail, trimmed with raw edge silk organza. Large petal work at the hem, all trimmed with raw edge silk organza. Open back with crisscross straps, hook and eye back. Longer hem at the back. Available in cotton or silk taffeta. "I want to create beautiful clothes that make women and men feel confident." Elegant lines, great colors,and exquisite details are a standard for a dress designer Prizy Sebastian. Prizy studied design at the University of Texas, moving to New York City to be in the heart of fashion. Great construction using such details as subtle pin tucking, soft gathers,and sophisticated pleating are important in her work. She only uses eco-friendly luscious silks, rich wools, and textured cottons to create her elegant pieces.